COPE FACILITY DOGS GO TO WORK! COPE dogs can be partnered with a teacher, counselor, health care worker, social worker or health professional for the purpose of providing social interaction, therapeutic intervention and canine assisted education for many different people. The dog accompanies his/her partner at work in order to augment their regular educational, social or therapeutic practices. 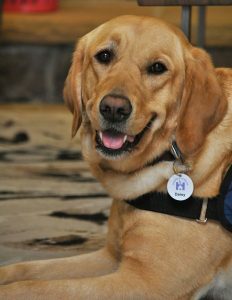 COPE’s approach to placing a Facility dog focuses on three major areas: the facility; the handler (the person(s) handling the dog at work) and primary caretaker (the person(s) who will be the dog’s caregiver/look after and be responsible for the dog at home); and the dog’s role in your facility. Please note that COPE prioritizes placing Facility dogs in the Simcoe County area and locations where we operate. There are often significant wait lists for Service and Facility dogs and occasionally we close our waiting list due to high volumes. If you are interested in hosting a facility dog, download the process, application and costs on this page. Please submit completed application to info@copedogs.org. It is recommended that the proposed handler submit the application.